You might not have a particular thirst for blood, but this slot game can help you satisfy your money cravings if you will cross over to the dark side. 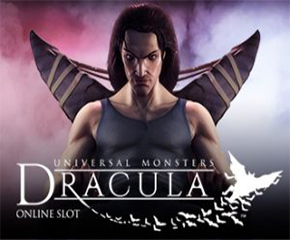 The Dracula slot game has some tantalising rewards up for grabs if you are willing to accompany this vampire on his cruise for victims..
Dracula is a game that has been created by NetEnt in conjunction with Universal Studios. 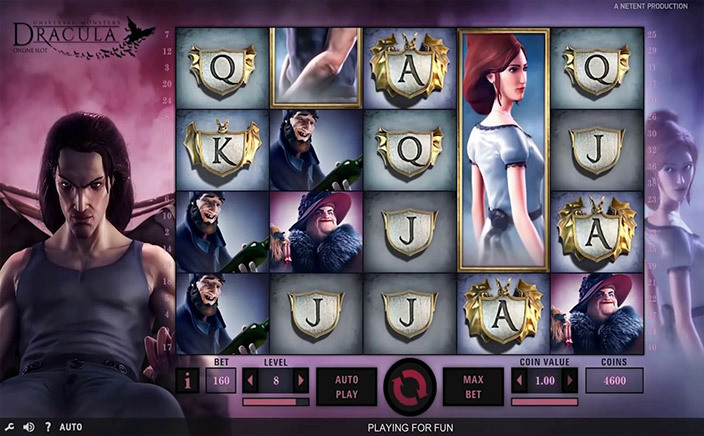 As a result of this collaboration, NetEnt’s unique entertaining style has been coupled with the classic tale to bring you a gruesome slot game that will thrill you as much as it chills. The Dracula slot game is a 5 reel, 4 row and 40 payline game that is based on the movie Count Dracula, by Universal Studios. The game begins with a brief clip showing the vampire chasing a terrified looking damsel into a dark ally and the scene fades out once he catches her and attempts to drink her blood. You can start playing the game by choosing a wager amount and then clicking Spin to watch what symbols you come up with on the reels. Wild substitutions: The wild symbol in Dracula is the W sign. You can use this symbol to swap out other symbols on the reels so that you can make a winning payline that can be used to get good payouts. Stacked wilds: The wilds in the game can become stacked, especially during the bat feature. Bat feature: In this feature, a colony of bats swoop across the reels and turn any random collection of symbols into the same symbol. This means that you can make a winning payline more easily and thereby get more payouts. Free spins: You can trigger the free spins round if you manage to line up the Dracula symbol next to that of the maiden as you play. You can get 10 free spins this way, which have the bat feature engaged while you play them. If you get a wild symbol on the reels during the free spins round, you can get two additional free spins. This more than makes up for the fact that the free spins round comes with no wager multipliers. Dracula is a chilling game that makes for a lot of great slots action, especially through all the bonus features. The graphics of the game are especially dark and eery and very well done. It’s a fun slot game to play for horror fans who want to earn a bit of money as they play.